22 August 2008, at 12:01p.m. AUSTRALIA - The Australian poultry industries have taken a number of pro-active steps to improve bird welfare, not only because healthy, stress-free birds are more productive but also because farmers are concerned for the welfare of their flocks. 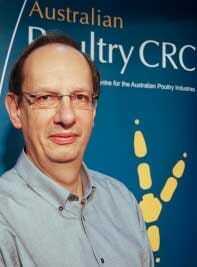 One such step was to provide financial and in-kind support to the Australian Poultry CRC's welfare program. The results of this support include a CRC project to improve uptake by chicken meat companies of welfare standards into their everyday production processes, reports the E-Chook newsletter from CRC's Poultry Hub. John Barnett, who was involved in the original RIRDC-funded audit which identified the welfare issues, says that, "After the CRC's project, implementation is up from around 50 per cent at the start of the CRC to over 80 per cent today." The new welfare standards impact on every stage of production from hatchery to processing and ensure, for example, that day-old chicks are maintained at correct temperature during transport from hatchery to farm. Another avenue of the CRC's welfare research has focussed on establishing a scientific method of assessing welfare. It is simply inappropriate to assume that the birds' response to their environment is the same as would be felt by a human in similar circumstances. What we need, therefore, is a method to objectively identify situations that create serious welfare risks for birds, rather than just rely on what we 'feel' is right. On a similar tack, the CRC's project on human-animal relationships in layers is investigating the interaction between humans, as stock-keepers, and birds. The ultimate goal of this work is to determine an optimal level of interaction so as to minimise stress on the birds. That is, tailoring the amount of care provided to keep the birds in the best possible condition without unduly disturbing them. However, very little of this work can take place in a laboratory; much of it must be performed on-farm under real-world production conditions. According to Lloyd Thomson, Commercial Manager for the CRC, "It is in this area that the 'in-kind' support from industry has been most valuable, permitting researchers to gain access to farms under the strict biosecurity requirements imposed by Australian poultry farmers."